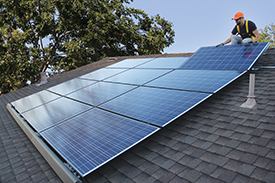 This FREE technical training is designed for solar installers preparing for the installation of Quick Mount PV's new rail-free mounting system, Quick Rack, on composition/asphalt shingle roofs. The training will help installers increase installation speed and efficiency as well as review solar roofing best practices to reduce liability on the roof. This presentation will also include an overview of Quick Mount PV's full product line. Enphase will be providing lunch and an afternoon program. Click here to sign-up now for the afternoon portion of the event. Both portions are free. 12:00 PM - Enphase will be providing lunch and an afternoon program. Click here to sign-up for the afternoon portion of the event. Both portions are free.